A wonderful year, filled with a vast array of stupidities, memes and time-wasters. Hot on the heels of the latest announcement to shock the public-at-large, memes and discussions have sprouted a plenty since it was revealed that Hostess was failing. Of course, as with anything in life, there are multiple slants with this story. Journalists are mulling over how its hard to believe that a fine american institution like Hostess could fail. Satirists, which easily outnumber those attempting to report the truth, have been much quicker to point out all sorts of angles, by way of reductio ad absurdem. Mayan predictions have been tackled from all sorts of directions. 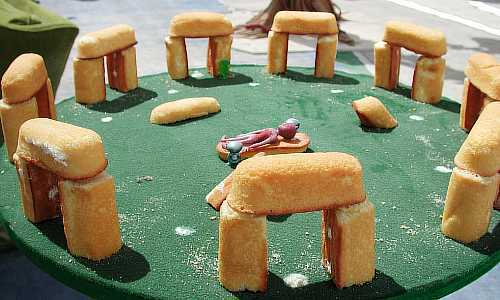 So, I suppose it’s no real surprise that Twinkies and Mayan prophecy have come together. While I cannot confirm at this time, I suspect Twinkies will remain safe in Canada. Here, they are manufactured by a Canadian company called VACHON. The quebec-based confectionary, in turn, is owned by another Canadian company called Saputo – or at least, it was. which is ironic, because their products are all made from comestible oil. In the comedy, Zombieland, one of the main characters is obsessed with the little yellow snack cakes. I can’t help but think that our society should tip our cowboy hats in appreciation for the joke inserted into the movie. We are led to believe Hostess was doing well enough during the events that led up to the Zombification of the United States, insofar as the two main characters stumble upon a Hostess truck. Of course, as I mentioned earlier… Vachon makes Twinkies in Canada. So, there’s the possibility of cross-border contraband happening. 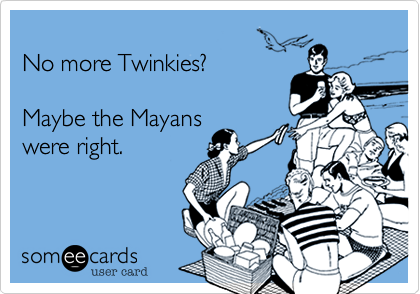 And because we’re talking about Twinkies, we don’t have to worry about them going bad/stale. They can survive an apocalypse! Maybe contraband is putting it a bit harshly. It’s not like Twinkies contain small choking parts like another delicacy available in Canada: The Kinder Surprise Egg. Cross the border with one of those and you’re looking at some ridiculous heavy fines. On the flipside, I’m sure some american shopper is gonna attempt a mass purchase of Twinkies in Canada, with the intent of selling them in the US. I can’t help but wonder… aside from the reported mismanagement of Hostess, what other factors came into play here to cause a producer of über-refined sugar snacks to fail so fantastically. All end-of-the-world jokes aside… Is this really a sign that the American public is becoming more conscious of their dietary choices? Oh wait… I forgot. For a clear indication of that happening, McDonalds would have to fail. While I’d love to see that happen, I will also take that as a sign that the apocalypse is in fact, nigh. This entry was posted in Critical Thought, Health and Fitness, Journalism, Non sequitur and tagged cake, calories, crap eating, garbage, hostess, junk food, junkfood, mayan, prophecy, snack cakes, thisiswhyyourefat, twinkies, vachon. Bookmark the permalink.